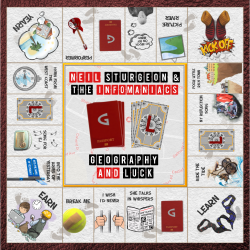 Neil Sturgeon & the Infomanics’ debut release is called ‘Geography & Luck’, an album which ranges from Americana to pop with more than passing nod to folk rock. The twelve track album produced by Raymond McGinley, of Teenage Fanclub fame, features a wide range of Glasgow musicians which allows it to draw on a variety of high-quality vocalists and instrumentalists. Their talents are highlighted throughout the album without ever overwhelming the storytelling vocals. Compared to Neil Sturgeon’s music from his other band The Goldenhour, the album is a more mellow and acoustic album that wouldn’t have fitted the garage rock sound of The Goldenhour. The single ‘NY Reflection Song’ is a true Americana piece with a great banjo picked solo, a reminiscing song about a lost friendship in New York City and definitely the one to get your toes tapping. Compare that with ‘Ride the Tide’, an acoustic-pop piece, about not realising you would miss someone until they left, although having the largest range of musicians compared to the other tracks, it is the most understated track on the record. Overall, there is a well-balanced mix of songs on the album, with something for everyone on it. It is an album that deserves to be heard by a wider audience, as its appeal covers so many genres.